When the Israelites were gathered at Mount Sinai, God gave them the Torah. Scholars and academics have spent lifetimes debating the exact location of Mount Sinai. The Sinai peninsula is covered with mountains, some wide and flat, others tall and rugged. Trying to establish which mountain is actually Sinai based on the fact that the Jews converged on Mount Sinai just short of 7 weeks after leaving Egypt, is almost impossible given the many different factors such as speed, route taken and stops made. There is a mountain on the Sinai peninsula that is called Mount Sinai (in Arabic Jebel Musa, the mountain of Moses), but many doubt that this is the true location. What do you picture when you think of Mount Sinai? Given the important event that occurred there, most would assume that it was a tall, grand mountain when, in fact, it was just the opposite: The Midrash relates that all of the tall mountains fought to be chosen as the location for the giving of the Torah. Mount Sinai, knowing that it was the smallest of the mountains, remained silent, and God chose Sinai because of its simple humility. The allegories of the Midrash are not whimsical fancies, but are an important means of teaching critical life lessons. Judaism considers humility to be a most important character trait. Moses is described as the most humble human who walked the earth. However, being humble, according to the Torah, does not mean making one’s self a doormat. Rather, a humble person will know his/her own strengths and self-worth (as well as his/her weaknesses), and will not need others to acknowledge his/her significance. This Treat was last posted on May 13, 2009. This Treat was last posted on May 13, 2013. Make challah for Shabbat and make some extras for Shavuot. Decorating our homes and synagogues with plants and flowers: According to the Midrash, at the time of the giving of the Torah, Mount Sinai burst forth in blossoms of verdant greenery, covered with plants and flowers. 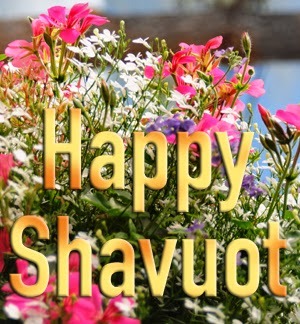 This is the basis for the custom of decorating our homes and synagogues with plants and flowers on Shavuot. 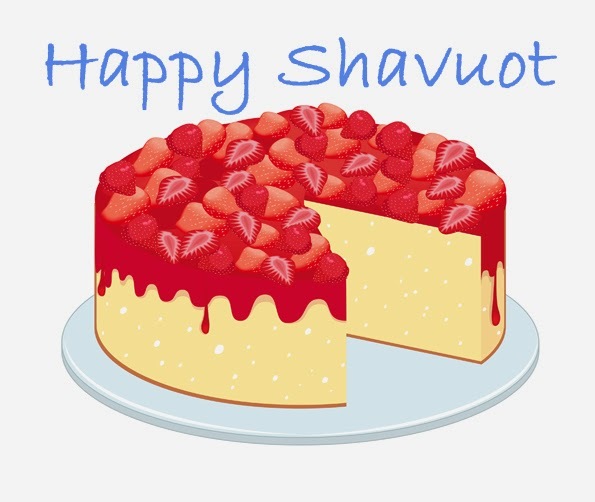 Dairy Foods: On Shavuot, it is customary to eat dairy foods – cheesecake and blintzes are particular favorites. Once the Torah was given, the Israelites refrained from eating meat because they needed to learn the laws of kosher slaughter and to make their utensils kosher. They specifically chose to eat dairy and give themselves the time necessary to learn the laws. On a more mystical level, the gematria (numeric value of the Hebrew letters) of the word chalav, milk, is 40. Forty corresponds to the forty days and nights that Moses spent on Mount Sinai learning the Torah. All-Night Learning: To demonstrate our love for Torah and our appreciation for God's revelation on Mount Sinai, it is customary to stay up all night on the first night of Shavuot either studying Torah, listening to lectures on Torah topics, or simply discussing Jewish ideas. Another reason given for the custom of learning all night is to atone for the apathy of the Israelites, who, according to tradition, actually overslept on the morning that they were to receive the Torah, rather than being wide awake in excited anticipation. This Treat was last posted on May 14, 2013. If the children of Israel received the Torah at Mount Sinai, why did Moses come down bearing only “the two tablets of the testimony” luchot ha’aidoot (Exodus 32:15), on which the Ten Commandments were written rather than a complete scroll of law? The Biblical narrative states that God brought the Israelites to Mount Sinai and spoke the Ten Commandments, beginning with “I am the Lord your God!” Some commentators argue that the people were so intimidated by God’s voice, that they could only tolerate hearing the first two commandments as they rang out from the heavens. The people then beseeched Moses to intercede and deliver the remaining eight commandments. Moses then ascended Mount Sinai and did not return to the Israelites for 40 days. Ten Commandments...forty days? Obviously, something more than Moses reviewing Ten Commandments was happening on that mountaintop. Tradition tells us that during the time Moses remained on Mount Sinai he received all of the written and oral Torah. God therefore began with the Ten Commandments, which could be understood and followed on a simple as well as a complex level. For example, honoring one’s mother and father (#5), on the simple level, means giving respect to one’s parents. When studied further, however, one discovers that this commandment is also about gratitude to God, the ultimate Creator. Thus, the Ten Commandments are seen as the cornerstone of the Torah, containing both the religious (“I am the Lord your God”) and legal elements (“Do not steal”) of the Torah. This Treat was last posted on May 18, 2011. “If I forget thee O’ Jerusalem, let my right hand wither” (Psalms 137:5 -Im esh’kachech Yerushalayim, tishkach y’meenee)...poignantly expresses the Jewish people’s longing for Jerusalem. The Bible guarantees that the land of Israel is destined to have one specific site that will be holy beyond all others and refers to this site as “the place which God shall choose to cause His name to dwell there” (Deuteronomy 16). The place God chose was Jerusalem. The old question of “the chicken and the egg” (which came first?) can be applied to the holiness of Jerusalem. Was the location of Jerusalem holy before the Temple was built or did Jerusalem become holy because the Temple was built there? According to the sages, Jerusalem is built upon Mount Moriah, the place where Abraham brought Isaac to be sacrificed (Genesis 22:14), indicating clearly that, beyond its role as the Temple location, the spot had inherent spiritual significance. It is traditionally assumed that King David had prophetic knowledge of this holiness when he selected Jerusalem to be the national and spiritual capital of the Jewish nation. In Jewish law, objects used for sacred purposes may not simply be discarded or destroyed but must be disposed of in a respectful manner (“Rava said: ‘Covers of single books of the Torah and cases of Torah scrolls, are accessories of sacred items [that are no longer usable] and must be hidden” -- Megillah 26b.) One can therefore readily understand that the city of Jerusalem, the place where the Temple stood, remains eternally holy. For nearly two thousand years the Jewish people could only be guests in their holy city (and sometimes not even that). On the 28th of Iyar in 1967, however, Israeli troops captured the Old City, unifying Jerusalem and allowing Jews to live and pray in the city that lives in our hearts. This Treat was last posted on May 12, 2010. When the opportunity occurs, choose to buy products from Israel. It is easy to be judgmental. Some might say that being judgmental is a necessary survival skill because it allows people to evaluate if they are being threatened. Those who study Mussar, the Jewish guide to self-improvement, understand that the “judgmental nature” of a person is one that must be both listened to and tuned out. At the heart of Jewish wisdom, however, is the firm belief that no person can truly judge another, because only God sees the complete picture. First impressions are often wrong. This is true not just about people, but about things and experiences as well. Almost everyone can recall situations that they expected to be terrible, but actually were quite enjoyable. At the heart of Ben Azzai’s advice is optimism. Many people judge the world pessimistically; they assume things are unfair or that success is unattainable. But really, without access to the larger picture, it is impossible to have an accurate perspective. Despising a person is often based on an assumption that the person has something he/she doesn’t deserve. Believing something is impossible is often a reflection of one’s preconceived notions of how the world should be. But God created the world; God knows what each person’s role in the world is meant to be, and God determines what is or is not possible. Try to focus on the positive. David Rosenkrantz is one of the many unsung heroes whose lives, cut short by the horrors of war, are honored on Memorial Day. Born in 1916, Staff Sergeant Rosenkrantz joined the army in January 1942. Volunteering for the Airborne, he was part of the 504 Parachute Infantry Regiment (PIR) and trained at Fort Benning and Fort Bragg. After recuperating in England, the 504 PIR was assigned to “Operation Market Garden,” which sent them into Holland. Their mission was to capture bridges near the towns of Grave and Nijmegen. While Sergeant Rosenkrantz’s body was never recovered, his dog tags were returned to his family over 50 years later, in 2011. It is interesting to note that they are marked with a "J" for Jewish, emphasizing how frightful it must have been to a young Jewish soldier to put himself in Nazi territory. Sergeant Rosenkrantz’s nephew, Dr. Phillip Rosenkrantz, has created a website dedicated to this brave Jewish soldier. Honor a fallen Jewish soldier by placing a stone upon his gravestone. The fact that the constitution of the colony of Carolina (later North Carolina and South Carolina), which was authored by the philosopher John Locke, included a call for the freedom of worship for “Jews, Heathens and other Dissenters from the purity of Christian religion,” makes it unsurprising that South Carolina has a long and rich Jewish history that predates the entrance of South Carolina into the Union on May 23, 1788. In fact, as early as 1697, four Jews were made citizens of the colony. As was the case in other Colonial towns, such as New York, NY, Newport, Rhode Island, and Philadelphia, Pennsylvania, the first Jews of Carolina were Sephardim. Many of them became successful merchants. In fact, some credit London-born Moses Lindo for making Charleston (then Charle's Town) a center of the indigo trade. The plant, which is the source of a very specific dye, grows well in South Carolina. While still in London, he noticed the high quality of the Carolina indigo. In 1756, he crossed the ocean, became an indigo planter and built up a significant supply of indigo. In 1762, Lindo was appointed “Surveyor and Inspector General of Indigo, Drugs and Dye.” In this position, he established a quality grading system for indigo and made it a major export of Charleston, South Carolina. A highly respected businessman, Lindo remained in office until he resigned in 1772. He died two years later. If you take a Shabbat walk, wish the friends and neighbors that you pass a Shabbat shalom. Today is the International Day of Biological Diversity, which was created in 1993 by the United Nations to promote discussions about issues of biodiversity. Biodiversity means that there is diversity among and within plant and animal life in a particular environment. There is no question that biodiversity is an important environmental issue. Each year scientists discover new wonders within the natural world, but there are also many animals (and plants) that are on the verge of extinction. Any discussion of Jewish ideas on biodiversity includes, almost by default, a conversation about Noah’s ark. To protect the world that had been endangered by humankind’s corrupt behavior, God devised a plan for preserving the original biological diversity that He had created in the world. The Torah makes it clear that Noah’s task was to include all of the animals of the world because all species are important to the Divine plan of creation. The story of Noah is one of the primary sources in the Bible that encourages diversity. But, it is not the only way in which Judaism expects people to take care of the world. There is, for one, the prohibition against destroying fruit trees, which provide sustenance for all levels of life. There is also a prohibition against cross-breeding species. One might not immediately see the restriction on cross-breeding as a promotion of biodiversity. From the perspective of Jewish tradition, however, it is a safeguard that preserves the natural order of the world. Even seemingly benign alterations in nature can, though not always, have devastating effects on the environment. Just think of the stories of foreign flora or fauna that have wreacked havoc because the new environment had no natural predators for that species. This does not always happen, and one can certainly point to improvements made by such scientific engineering, but the Torah sees greater benefit in protecting the specific integrity of all of God’s creations and teaching the world’s inhabitants to protect and appreciate nature as it is. Note: While the act of cross-breeding a species is prohibited, however, once a new species has been created, such as the Ugli fruit, one may partake of it. Do your best to protect the environment. Generally, the Sheva Brachot are recited under the chuppah over a cup of wine. The blessings, which are discussed at great length in the Talmud, Ketubot 7b-8a, are either recited by a rabbi/chazzan or are assigned as honors to be recited by distinguished wedding guests. The seven blessings begin with the blessing over the wine, as a sign of joy and a means of sanctifying the ceremony. The second blessing lauds God as He “who created everything for His glory,” which reminds the bride, groom and all wedding guests that, at such a joyous celebration, there is no better time to praise God the Creator. The third and fourth blessings are similar, in that they refer back to the Creation of humankind. The third blessing praises God, “the Creator of Adam,” and the fourth blessing details how God created Adam in His image and “provided for the perpetuation of his kind.” According to tradition, God created Adam as a creature both male and female, and then separated them. When a man and woman come together in marriage, it is as if they are recreating the original, ideal merged creation. The last three blessings, praise God for bringing joy and happiness to the Jewish people and to the bride and groom. The seventh blessing, which is the longest, is often sung at the chuppah (with the wedding guests frequently joining in). * For a translation of the Sheva Brachot, please click here. Whether a friend is getting married soon or is recently married, share in their joy by wishing them "Mazal Tov." The Homestead Act of 1862, which was signed into law by President Abraham Lincoln on May 20, 1862, opened up a huge swath of the western United States to settlement. In order to claim land, a homesteader had to file an application, improve the chosen land and file for a deed of title. The only requirements to be a homesteader were that the applicant be at least 21 years old or the head of a household, and had never taken up arms against the government. Among these settlers was a small but fascinating group of women who came west as part of an arranged marriage, not dissimilar to the romantically named Old West "Mail Order Brides." One better-known stories that has become a highlight of studies of Jews and women in the Old West is that of Rachel Bella Kahn Calof (1876-1952), who is known because the transcript of her autobiography (written in Yiddish in 1936) was translated into English and published. Born in the Ukraine, the orphaned Rachel was raised by her grandparents. At age 18, her grandparents arranged her engagement to Abraham Calof. She traveled to America, met him in New York City, and agreed to go with him to North Dakota. Rachel’s journal makes it clear that living a Jewish life on the Plains was not easy. In addition to the physical hardships (freezing winters, starvation, etc.) observing ancient rites such as circumcision was extremely difficult. After 23 years on their homestead, which eventually was successful, the Calofs moved to St. Paul Minnesota in 1917. This Treat was written in honor of Jewish American Heritage Month. Research the history of Jews in the area where you live. Because of the dedication of Rabbi Ezra Attiya (1885-1969), hundreds of Sephardic Jews chose to extend their education, scores decided to dedicate their lives to Torah study and dozens of distinguished rabbis served in Sephardi communities around the world. Rabbi Attiya was the long-awaited child of Rabbi Yitzchak and Leah Attiya, who had lost several children in infancy. During this pregnancy, the couple from Aleppo, Syria, went to the town of Tedef, where local legend believes the prophet Ezra to be buried (there is also a tomb attributed to Ezra in Iraq). They prayed there and promised that, if the child were a boy, his life would be dedicated to Torah. Ezra and his only living sibling, a younger brother named Eliyahu, studied with their father, who was a respected teacher. Eventually, the family moved to Jerusalem. Tragically, shortly thereafter, Rabbi Yitzchak Attiya died. The family was poverty stricken, and Mrs. Attiya became a cleaning woman. Poor as they were, Ezra continued in his dedicated Torah study, surviving mostly on pita spiced with salt. In 1907, Rabbi Attiya joined the staff of the newly established Yeshivat Ohel Moed. With the outbreak of World War I, however, Rabbi Attiya fled to Cairo to avoid conscription in to the Turkish Army. There he opened a yeshiva that grew to 100 students. He returned to Jerusalem in 1922. After teaching at Yeshivat Ohel Moed for a year, Rabbi Attiya joined the newly formed Yeshiva Porat Yosef, which would become the leading Sephardi yeshiva. Rabbi Attiya was dedicated to his students. He even offered to reduce his salary in order to cover the tuition of one promising but impoverished student. One story told about Rabbi Attiya describes his incredible contribution to the education of the late Rabbi Ovadia Yosef, (who went on to become one of the world’s leading rabbis of his age), when he himself volunteered to work in Rabbi Yosef’s father’s grocery so that the bourgeoning scholar could remain in yeshiva. 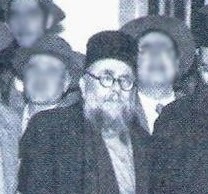 After a prolonged illness, Rabbi Ezra Attiya passed away on 19 Iyar, 1969. Take advantage of any opportunity to study Judaism further. Rabbi Shimon bar Yochai (Rashbi), whose yahrtzeit is on Lag Ba’omer, was one the five students who began studying with Rabbi Akiva after the horrible plague that took the lives of 24,000 of his students. Rashbi was a fiery and fascinating personality. Seeing a man ploughing and sowing, they exclaimed, ‘They [the Jewish farmers] forsake life eternal and engage in life temporal!’ Whatever they [Rashbi and Elazar] cast their eyes upon was immediately burnt up. Thereupon a Heavenly Echo came forth and cried out, ‘Have you emerged to destroy My world: Return to your cave!’ So they returned and dwelt there twelve months, saying, ‘The punishment of the wicked in Gehinnom ("Hell") is [limited to] twelve months.’ A Heavenly Echo then came forth and said, ‘Go forth from your cave!’ (Shabbat 33b). According to tradition, Rashbi requested that his death be marked by rejoicing as the soul takes its proper place with G-d. The great sage was buried in a cave on Mount Meron, where, each year, tens of thousands of people gather on Lag Ba’omer to joyously celebrate the anniversary of his death. While the study of Kabbalah (Jewish mysticism) has always been a part of Torah study, it only gained public prominence in the early 14th century when a Spanish rabbi, Moses de Leon, published the Midrash de Shimon bar Yochai, better known today as the Zohar. According to Rabbi de Leon, the Zohar was a compilation of the teachings of Rabbi Shimon bar Yochai (Rashbi) that were recorded by his son Elazar and his disciples shortly before the great sage’s death. Jewish tradition believes that these teachings were given to him by the prophet Elijah while Rashbi and his son lived in a cave for 13 years, hiding from the Romans. The origin of the Zohar was, and remains, a controversy. Many believe that it was actually written by Moses de Leon, while others firmly accept de Leon’s attribution of the text to an ancient manuscript by Rashbi. The Zohar, which means "The Splendor" or "The Brilliance," contains a mystical discussion of God, the structure of the universe, the nature of souls, sin, redemption, good and evil and related topics. It is written in Aramaic and Hebrew, and is structured around the weekly Torah portions. Numerous commentaries have been written that are studied alongside it. If you have a picnic or barbeque, make certain to bring water with which to wash your hands before eating bread. The period of mourning* (for the 24,000 students of Rabbi Akiva who died of plague) associated with Sefirat Ha’omer is not observed on the 33rd day of the Omer, a day known as Lag Ba’omer. In Hebrew, every letter has a numerical value. "Lamed" equals 30, and "Gimmel" equals 3, thus Lag (spelled "Lamed Gimmel") Ba'omer, literally means 33 (days) in the Omer. Because the mourning period is now over or suspended for the day, Lag Ba’omer is a popular date for weddings (which are not held during most of Sefirat Ha’omer) and haircuts. * Some have the custom not to cut a boy's hair until he is three years old, the age at which the child first begins to learn Torah. Since haircuts are delayed until after the period of mourning, and because there is Kabbalistic significance to hair, many put off the hair-cutting ceremony, called an Upsherin, until Lag Ba'omer. Lag Ba’omer is also the anniversary of the death of Rabbi Shimon Bar Yochai, the famed Talmudic Kabbalist whose teachings are revealed in the Zohar. In Israel, tens of thousands of people travel to Mount Meron (near Safed) to observe his yahrtzeit near the cave in which he was buried. As per his deathbed request, his death is celebrated rather than mourned. It is also common for families and friends to gather together for a bonfire and/or picnic on Lag Ba'omer, often on Mount Meron. There are several reasons given for this custom. One is that the word Zohar translates to “shining light,” and bonfires bring light to the world. *Some people observe 33 days of mourning starting from the beginning of the month of Iyar until three days prior to Shavuot. In such cases, however, Lag Ba'omer is excluded from the mourning customs. The Talmud (Yevamot 62b) relates that “Rabbi Akiva had 12,000 pairs of students...and all of them died in one period of time because they did not act with respect toward each other...they all died between Passover and Shavuot...and they all died a terrible death.” The Talmud then goes on to explain that, according to Rabbi Nachman, the deaths were caused by a croup-like illness that resulted in the victim’s suffocation. Think of it: 24,000 students! And all but 5 of them (as stated elsewhere in the Talmud) succumbed to this horrible plague. Unfortunately, love of God and love of God’s Torah, does not always translate into proper moral comportment. Instead of encouraging each other’s pursuits in learning, the students busied themselves with showing off their own Torah knowledge in order to “one-up” their fellows. As punishment for this great failing, the students were struck by the plague. As the Talmud notes, this great tragedy occurred during the time period between Passover and Shavuot and lasted until Lag Ba’omer, the 33rd day of the Omer. For this reason, 33 days of Sefirat Ha’omer (the Counting of the Omer) are considered days of mourning. Communal mourning in Jewish tradition is expressed by the Jewish people by refraining from certain activities. During the 33 days of Sefirah, the precluded activities include: 1) cutting hair, 2) going to live performances of musical entertainment and 3) getting married. Make plans for this Sunday to enjoy Lag Ba'omer with music. In Pirkei Avot/Ethics of the Fathers, Rabbi Joshua is quoted saying, “An evil eye (ayin harah), the evil inclination (yetzer harah) and hatred of other people (sinat habree’ot) remove a person from the world (Pirkei Avot 2:16). Although there is much dispute regarding the meaning of this Mishnah, according to some commentators, the “evil eye” is the negative power of jealousy. Usually this negative emotion is limited to questioning by one person why others see the fulfilment of their desires, while their own desires are left unfulfilled. But, sometimes jealous thoughts become nastier and, in the worst scenario, can lead one to cast a curse on the other person. No matter the level of one’s jealousy, whether negligible or monstrous, the “evil eye” creates a draining negative energy within a person. The nature of evil desire is also not agreed upon by all, but it is usually considered to refer to an inner-voice that tells a person that doing an incorrect or evil action is really okay to do. Anyone on a diet will recognize it as the internal voice that pushes the dieter to take just one more cookie. The evil inclination makes one feel a sense of freedom, but following those urges most often leaves a person with regret and a negative sense of self. Hatred of other people is perhaps the most obvious of the three. As is often pointed out, most people hate in others, things that often remind them of themselves. Rabbi Joshua’s statement that these three things remove a person from the world can be understood in several ways. On a physical level, one could understand this as a warning against hypertension and the other negative physical effects of being angry with the world and with one’s self. On an emotional level, jealousy, seeking personal gratification and feeling hatred for others, separates a person from other people. On a religious level, all three acts insinuate incorrectly that a person has God’s ability to judge or control the world. Try to find the positive in every situation. What does the Supreme Court of Pennsylvania have to do with the oldest synagogue in that state? Congregation Mikveh Israel (Originally Kaal Kadosh Mickve Israel) was founded in the 1740s by the community of Sephardi Jews then living in Philadelphia. It became an official chartered organization in 1773. By the time the Revolution was over in 1783, the congregation was in the midst of its first building campaign. 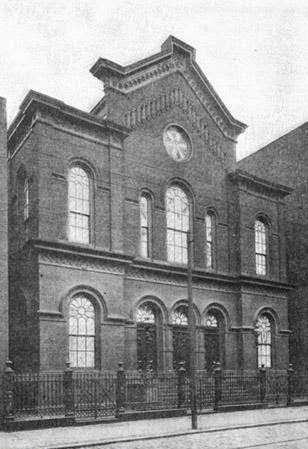 As people began to return to their home cities (although many remained in Philadelphia), the members found themselves in need of funds to complete the building. It is telling that many prominent Philadelphians enlisted in the cause (including Benjamin Franklin). As the population settled and then slowly began to absorb newer immigrants, other Jewish organizations began to form. Rodeph Shalom, founded in 1795, catered to the Ashkenazi community. In the 19th century, even as many local Jewish communities were just beginning to appear, others were already shifting their identities. Wishing to secure its identity, Mikveh Israel created a congregational constitution that not only established the basic membership regulations, but also decreed that the services would always be conducted according to the custom of the Portuguese Jews. The constitution was presented to the Supreme Court of Pennsylvania and was approved on May 14, 1824. The court noted that the synagogue constitution was an example of the new order of the times. Written in honor of Jewish American Heritage Month. On the first anniversary of the Exodus from Egypt, the Children of Israel prepared to celebrate their first Passover as free people. God decreed that they should eat matzah and maror (bitter herbs) in commemoration of the great event, and, most importantly, that the Israelites should all partake of the Passover sacrifice (lamb). On the eve of the second Passover, Moses was approached by a group of distraught men. “We are unclean because of the dead body of a man; why are we being held back so that we cannot bring the offering to God in its appointed time among the children of Israel” (Numbers 9:7)? Contact with the dead rendered a person tamei, spiritually impure, and any person who was tamei was forbidden to partake of the Paschal lamb. In response to their plea, Moses sought instruction from God. God responded that anyone who was tamei due to contact with death or who was on a far-away journey at the time of the Passover offering (14th of Nisan), would then offer the Pascal lamb one month later, on the 14th of Iyar. Those celebrating “Pesach Shaynee” (Second Passover) had to eat the meat of the sacrifice together with matzah and maror, exactly as on a regular Passover. Today, without a Temple, no one is able to bring a Passover sacrifice. Thus the laws of Pesach Shaynee have little practical effect in day to day Jewish life. However, there is a custom to eat some matzah on the 14th of Iyar to mark the date of Pesach Shaynee for ourselves and for future generations. This Treat was last posted on April 24, 2013. Reincarnation is a word that to most Jews screams of foreign cultures. What is not common knowledge, however, is that the reincarnation of souls is a concept found in Judaism known as gilgul. Before discussing any aspect of gilgul, Jewish Treats feels that it must advise you that this is an extremely complex kabbalistic idea, which we can only present in a broad and superficial manner. Gilgul is not mentioned in the Five Books of the Torah, nor is it a focus of the sages of the Talmud. In fact, the concept of gilgul only became a topic of study in Medieval times. It was discussed by scholars such as Saadia Gaon (882-942) (who rejected the idea) and Nachmanides (1194-1270) (who accepted it). It was the kabbalists of Safed, however, who delved into the depths of the idea of reincarnation. The teachings of the Arizal (1534 -1572) were published by his disciple, Rabbi Chaim Vital (1543-1620), in the book Shaar Hagilgulim. These teachings then gained prominence in the early Chassidic movement. This Treat was last posted on August 20, 2010. In honor of yesterday’s Mother’s Day Celebration, Jewish Treats presents a brief introduction to some of the unnamed mothers of well-known Biblical personalities. The mother of King David was a woman named Nitzevet the daughter of Adael. David was the eighth and youngest son of Jesse, but the text of I Samuel 16:11 implies that David was not accepted by his family (since David was left with the flocks when they were called by Samuel to offer sacrifices to God). The reason for this, according to tradition, is that people questioned David’s paternity. The story is that Jesse separated from his wife, Nitzevet, after their seventh son was born because he began to doubt the legitimacy of the conversion of his grandmother, Ruth. After several years, Nitzevet, missing her husband, pretended to be the maidservant whom Jesse had chosen as a concubine. When Nitzevet’s pregnancy was discovered several months later, Jesse chose to raise the child in his household, but neither he nor their older sons believed his paternity. Nitzevet’s young son was treated like a servant until the Prophet Samuel anointed him the future king of Israel, proving the legitimacy of both Ruth’s conversion and of David’s paternity (for a child born of an illicit union could not be chosen as king). The mother of Samson was named Zelalponith, which means "turned toward an angel." Zelalponith was childless. One day, an angel appeared to her and predicted that she would have a son, but warned that the child must be raised as a Nazarite and that the hair on his head must never be cut. When the angel appeared to Zelalponith again, she quickly summoned her husband so that he too could hear the unusual directions for raising their promised child. The mother of Abraham was Amathlai, the daughter of Karnebo, but little more is known of her. Interestingly enough, the same passage in the Talmud that presents these names also states that the evil Haman’s mother’s name was Amathlai the daughter of Orabti. Nitzevet, Zelalponith, and the two Amathlais are named in Talmud Baba Batra 91a. When someone asks your for help, take a few moments to listen to, and consider, their request. In honor of all our favorite Jewish Mothers, we've decided to re-Treat this special Mother's Day edition of Jewish Treats! Don’t forget to call your mother today, or send her flowers or a card. For those very, very out of the loop, today is Mother’s Day. Mother’s Day is a day set aside to show the moms in our lives how much we appreciate them. It’s a sweet and wonderful idea...but according to the Torah, every day is Mother’s Day. The very first commandment that God gave to Adam was to “be fruitful and multiply.” Traditionally, this mitzvah is only considered obligatory upon men, not women. This seems strange. After all, women are the ones who carry the children in the womb, nourish the infants from their breasts, and, traditionally, take the brunt of the child-rearing responsibility. If anything, “peru oo’revu,” be fruitful and multiply, should be a woman’s mitzvah! According to the sages, however, the mitzvah of “peru oo’revu” is not obligatory on a woman because of the inherent dangers in childbirth. It has only been in the last 100 years or so that the number of fatalities during birth has become minimal, and Torah law does not command people to put themselves in life-threatening situations. Perhaps, however, the danger inherent in motherhood is not just physical. Motherhood changes a person, restricts her and demands that she sacrifice many of the things she most values in life (sleep, independence, etc.). At the same time, through motherhood, a woman has the chance to not only experience the immense power of creation, but also to emulate God's endless ability to give. Motherhood, therefore, is both a choice and an opportunity. And it is because of this choice, and the sacrifices inherent therein, that one should give his/her mother honor, respect and even gratitude, not just on Mother’s Day, but every day. For more on the mitzvah of honoring one's mother and father, please click here. This Treat was last posted on May 12, 2013. It is highly unlikely that Moses, Hillel or even Maimonides (all experts on Jewish law) ever worried about what to write on a child’s birthday cake. But different societies have different norms, and, today, a birthday cake with a delightfully sugary “Happy Birthday” is standard for any birthday celebration. For Jews observing the laws of keeping the Sabbath, however, the words on the cake may* present an interesting challenge. To break the words while cutting the cake may fall into the category of mo’chaik, erasing - one of the 39 m’la’chot (creative acts forbidden on Shabbat). Erasing is considered a constructive act because the builders of the Tabernacle would erase incorrect letters marked on the boards (for ease of assembly) and mark them correctly. The m’la’cha itself prohibits the obliteration of letters or characters and cleansing a writing surface. Avoiding mo’chaik on Shabbat merely requires that one pay attention and be careful with details. For instance, when opening a package of food, one should try to avoid tearing any letters or breaking any words. (The tear may, however, go between two words). As for birthday cake, either cut between the words (but the piece may be huge...) or write the birthday message on a removable cookie! *There are many differing opinions on this subject and one should consult one’s own rabbi with specific questions. This Treat was last posted on August 6, 2010. If you are planning to have a birthday barbeque, where you know meat will be served, used soy or rice milk in place of dairy milk when baking dessert. 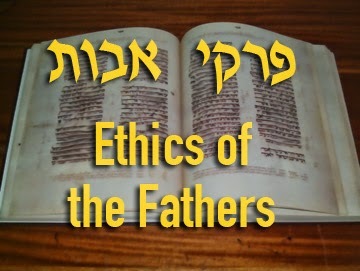 The Mishna Pirkei Avot (Ethics of the Fathers) is filled with wise advice and insightful statements. Among those of the first chapter is a fascinating instruction given by Avtalion, a first century B.C.E. rabbi. He said: “Sages, be careful with your words lest you incur the penalty of exile and are called to a place where the waters of learning are impure and the disciples that come after you drink of them and die; and the Heavenly Name is consequently profaned (Pirkei Avot 1:11). In the first century before the common era, exile was a very real risk. Among the Jewish people, the Pharisees and the Sadducees were battling for control of Jewish leadership. But, the Roman Empire was in control of what was then known as Judea, and the disorder within the Jewish ranks escalated into civil unrest. This was the era leading to the destruction of the Second Temple. Given the tempestuousness of the time, Avtalion’s words were words of practical and necessary caution. Exile as warned of by Avtalion are not a great threat today. Nevertheless, the real consequence that Avtalion warns against is that an exiled sage will stray far from Jewish life and mislead those who follow him, which will result in a “Chilul Hashem,” desecration of God’s name. This is the risk that remains very real today. If you enjoy the words of Jewish Treats, please share them. From the annals of history, we are often left with the mistaken impression that all Jewish immigrants to the United States in the early twentieth century arrived through Ellis Island. Certainly, millions of Eastern European Jews did come through New York, where many of them settled on the Lower East Side of Manhattan. However, Ellis Island was not the only port of entry to the United States, and approximately 10,000 Eastern European Jews came to the United States as part of the Galveston Movement, also known as the “Galveston Plan,” which brought them to Galveston, Texas. A distinct majority of the new Jewish immigrants fit the description of the Statue of Liberty’s “huddled masses yearning to breathe free.” They came to America in near poverty to escape persecution and turned to the already established Jewish community for help. The sheer numbers, however, were overwhelming. Jacob Schiff, a successful Jewish banker, businessman and philanthropist and a pillar of the German-Jewish community in New York, initiated and financed the Galveston Movement to divert the flow of immigration from the overcrowded tenements of New York. In 1907, the Jewish Immigrants Information Bureau (JIIB) was created to organize the Galveston Movement. They partnered with the European Jewish Territorial Organization (ITO), which promoted and implemented the plan in Russia and Romania. The emigrant Jews first traveled to Breman, Germany, and from there to Galveston, Texas, where they came under the care of Rabbi Henry Cohen of Congregation B’nai Israel. He greeted the immigrants, assisted them through the immigration process and then helped them move to other parts of the midwest, as Galveston was not a particularly large city. The Galveston Movement was in effect from 1907 until 1914, as the outbreak of World War I ended this era of Jewish immigration to Galveston. This Treat was written in honor of Jewish American Heritage Month (May). As flowers bloom, let your smile brighten the world. 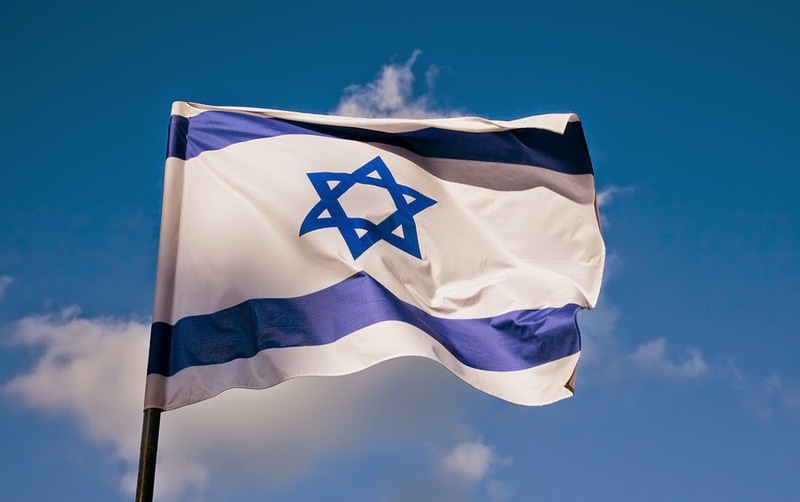 The Israeli flag was specifically designed with stripes to recall the image of a tallit - the Jewish prayer shawl. Its top and bottom blue stripes are reminiscent of the sky and the sea. While some tallit (tallitot) have blue stripes, others have black or white or a veritable rainbow of colors. We need to ask: Why the stripes, and is there any significance to the colors? The stripes in general are present to beautify the four-cornered garment, in fulfillment of a loose understanding of the verse (Exodus 15:2), “This is my God and I will glorify Him.” This principle is often invoked as a source requiring Jews to make an object used for a mitzvah as beautiful as possible (within one’s means, of course). Think about elaborately designed candlesticks, menorahs, mezuzahs, spiceboxes, etrog boxes, chuppahs, beautifully adorned Torahs, mikvehs and synagogue structures, and you get the idea. Blue in particular has significance as the color associated with the tzitzit (fringes) commandment (Numbers 15:38), which originated from a special aquatic creature called “hilazon.” The blue is meant to remind Jews of the sea, which reminds us of the sky, which reminds us of God, which reminds us to be good Jews (Rashi’s comment on Numbers 15:38). As the official blue color for the tzitzit was unavailable for hundreds of years, blue stripes were therefore placed on the body of the tallit garment to serve as a reminder of the commandment. This Treat was last posted on September 18, 2008.